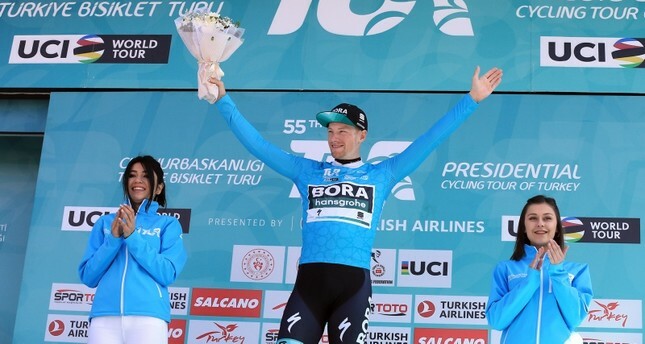 Irish cyclist Sam Bennett of the Bora–Hansgrohe team on Tuesday won first stage of the 55th Presidential Cycling Tour of Turkey. The race began in Istanbul on Tuesday and will end in the same city on April 21. The first 156.7-kilometer (97-mile) stage began in Sultanahmet Square, which is surrounded by iconic Istanbul landmarks like Hagia Sophia and the Blue Mosque. Cyclists then headed to Tekirdağ, west of Istanbul. Bennett, 28, won seven stages in the past two races. In the world's only cycling tour connecting the continents, cyclists will also ride at the final stage in the Eurasia tunnel connecting Asia to Europe beneath the Bosphorus Strait. The 55th edition of the Presidential Cycling Tour of Turkey kicked off in Istanbul on Tuesday as a part of the "UCI World Tour" calendar for the third time. Some 119 cyclists from around the world are competing in the event that originally started in 1963 as the Tour of Marmara, named after the northwestern region where Istanbul is located. Four World Tour teams are also among 17 teams which will cycle about 1,000 kilometers (621 miles) during six days. The race has been broadcasted in 185 countries. The race usually picked Istanbul for the starting point in past years, but it was largely a Mediterranean and Aegean affair as cyclists competed on scenic routes encompassing Izmir and Antalya in the south.